3. music, both natural and human made – I am keenly aware that I am more attuned to the latter but I can also appreciate the sounds of nature. Some examples of natural music during this sojourn: the calls of birds, frogs and wind; a flock of sandhill cranes singing their crossing of the evening sky, like a chorus of squeaky gates; the bullfrogs’ vibrational drone, perhaps an Indian tambura; the wind through a forest of pines, a soft whoosh, similar to a distant train or the persistent ocean ebb and flow; the high pitch howl of a coyote. Magical sounds. Real sounds. Placeness can be perceived through sound as well as sight, or feel. Or through all of these things together. At the site of the retreat was an overwhelming sensual experience, a place of spirit – a spirit of place. 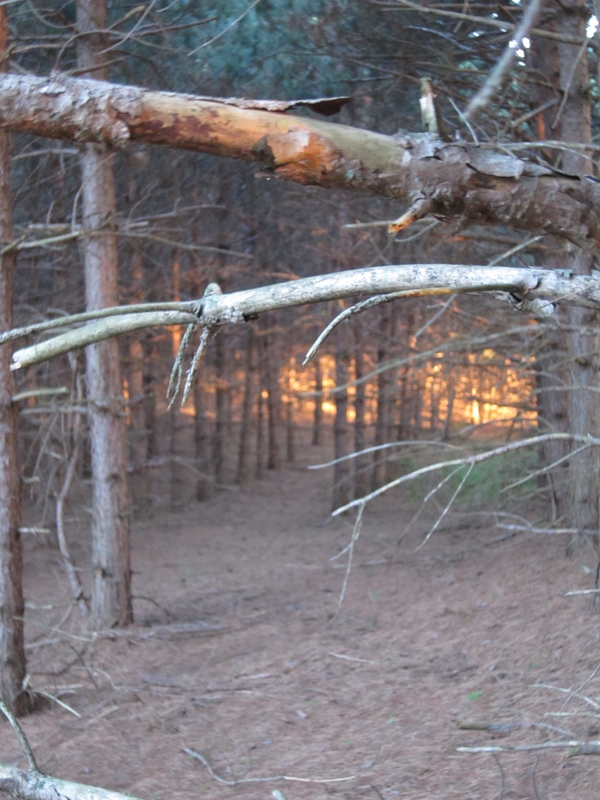 There, in this mid-Michigan landscape, was a pine forest planted in rows, straight lines, aisles, allees in the woods, chorus lines in an endless mirror. Row after row, uniform rows, columns, stud walls, buttresses holding up roofs of scented leaves, cathedrals of nature, a crunchy carpet of brown needles below. 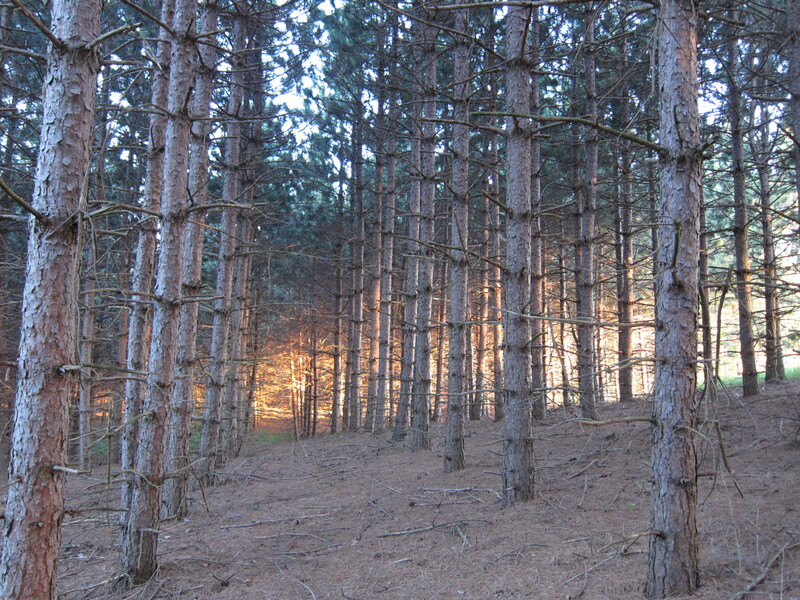 Upright, alert, an army of trees, battalions, natural fence posts. The wind rushing through the totemic figures, the light penetrating and generating an orange glow off the trees and thick floor matting. Space is defined, place is created. Sight, sound, feel. Joy. 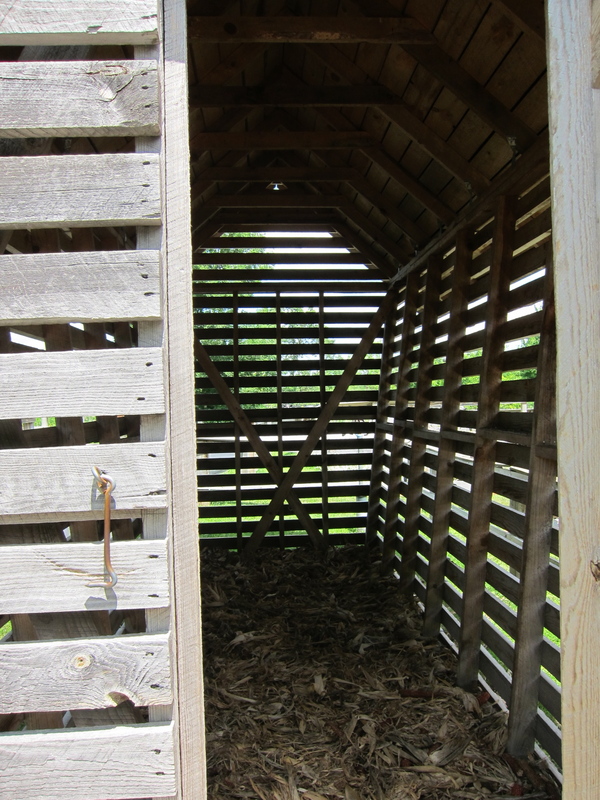 Or inside an empty corn crib built of horizontal wood lath with light filtering through, corn husks on the floor. A tiny chapel for one or two who enter and notice. An odd birdhouse-shaped structure, almost a cartoon rendering of a house with no right angles. This basic, practical container becoming a beautiful space and light container, a filtering device for viewing the world, or a space all its own. Genius loci is a concept defined by the Romans as a protector of a site, a deification of a unique place that makes it something worth defending. Random House Dictionary’s entry for genius loci is “the peculiar character of a place with reference to the impression that it makes on the mind.” Simply and modernly put, a “spirit of place.” Alexander Pope incorporated the concept into landscape design, now an underlying principle of landscape architecture – that the overlay of design should be adapted to its context – in order to express the uniqueness of place. From personified tutelary spirits that exemplify a place to a pervasive spiritual sense of a particular site, it all reveals that throughout human history, the interaction with “place” is significant. Arslocii begins with Genius loci, but that’s only half of it. 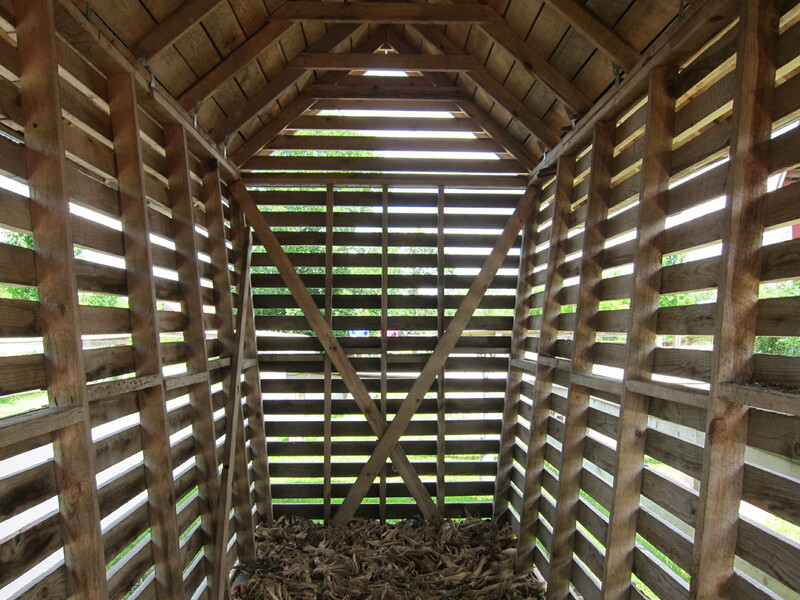 Arslocii is the combination of a special site with something else – something permanent, or something fleeting, which causes an enhancement of both and creates an experience of placeness from the two. It is the pairing and synergy, ergo the two “ii”s. It is an artful relationship, one of the spirit and of the mind, of the place and of what’s placed in the place, in tandem. And the whole is greater than the two parts. 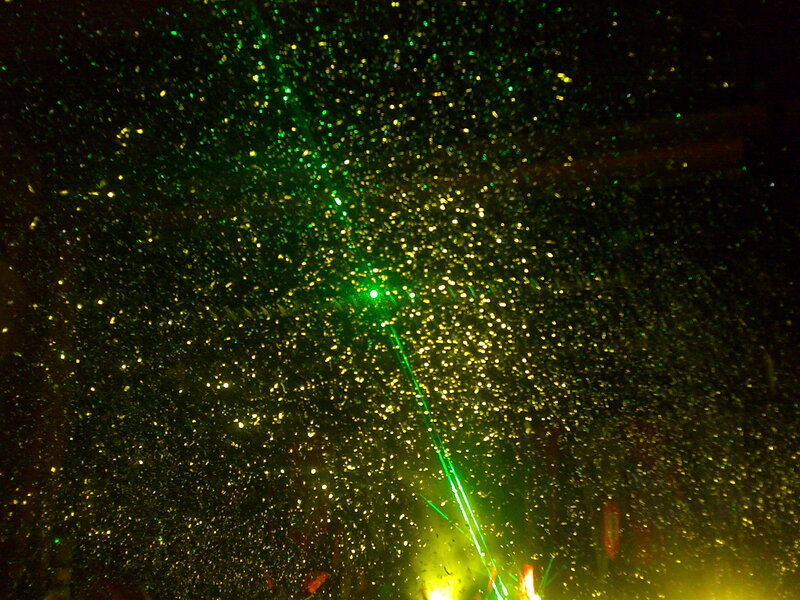 Back at the retreat, as we moved symbolically from leaving our joylessness behind and welcoming our newfound joy, we each in turn threw a handful of glitter up into the air. It was a partially cloudy day with the sun ducking in and out intermittently, a soft breeze moving the clouds playfully. The glitter was tossed, it caught the sunlight, was carried by the wind and created magic as it cascaded in waves to the ground – a fairy veil of sparkly energy, atoms made visible, tangible sunlight. It lasted but a moment but what a spectacular moment. Joy. Arslocii. Sometime back in the ‘60s or early ‘70s (which, as everyone knows, was still the ‘60s), a bunch of people got together in a theater to perform a piece of conceptual art. What they did in that theater, up onstage, was to live in it. They just went about their daily lives, 24 hours a day, and, all the while, audience members came and went, watching the “actors” simply live their lives, or as close to that as one can do when one is being observed. Those onstage pretended not to be on view; those watching pretended not to be voyeurs. It was a perfect exemplification of the theatrical fourth wall. But, more, what this conceptual piece did – besides acting as a precursor of the classic PBS series, “An American Family,” as well as just about every reality-TV show to come, especially “Real World” – was to elevate (if that was the direction) the act of everyday living to a functional definition of art. And, by default, turning each one of those who were living onstage into artists. Art did not imitate life, nor vice versa – they were one and the same. To extend the argument, aren’t we all, then, practitioners of the art of living? And aren’t the “stages” upon which we “perform” places of art: in design, accoutrement and action? And, therefore, do not each of these places, to one degree or another, have a placeness and, for our purposes here, are discussable in terms of placeness as art? And, what we have thought about for some time, and which has been brought to bear more intensely recently, is that perhaps the most palpable sense of placeness, and placeness as art, is resident in those places where those who lived there live there no longer, where the overwhelming power of placeness is shaped by the absence of what had once been there and by our memory or imaginings of the people and creatures and objects that once were. All this, as disputatious prelude, to get us around to the point: that in the past few weeks we have experienced the death of a mother – the last of our parents – and a cat, the last of a litter that was born on our kitchen floor, beginning a mutually loving relationship between four felines and two humans that lasted nearly 19 years. Their loss has renewed our feeling that among those places most redolent of placeness are those where ones who lived there are gone; that a room we visited – one that once had furniture we sat on and touched, and living beings we communed with and kissed, and smells and sounds and other things we took for granted – now, vacant, seemed somehow more filled with all of that, and with deeper feeling and meaning, importance and urgency: not inhabited by ghosts, but filled with echoes, not seen with a measured eye but apprehended by recollection or by some sixth or seventh sense we have yet to divine. 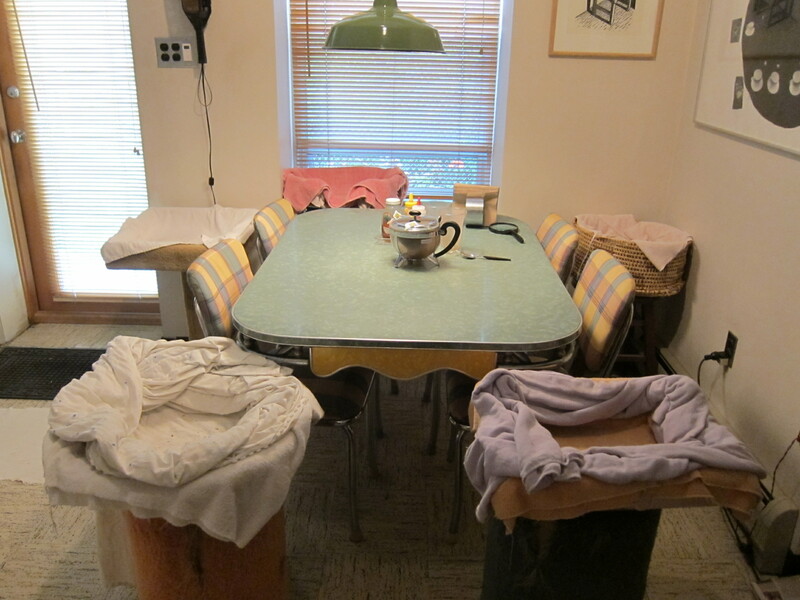 In our house, in the kitchen, we surrounded the table with cat beds, raised to the level of the tabletop, so that when we ate, our cats ate with us; when we watched TV there, they watched with us – one family, together. Soon, that spot became a central place in our home: no matter where the cats might spend their days, they would find their way to the beds, and us, to be fed, to be rubbed, to nap, each to his or her own favorite bed, or the one that the pecking order assigned each to. When the four became three, there was some shuffling of spots, but mainly it remained the same. When three became two, there was more of a freedom for the survivors to select any bed they wanted, within the parameters of cat power politics. When two became one, every bed was our last cat’s, and she used all of them. But now, four have become none, and yet … there they all are again, we can see them, in their prime, where they belong, waiting for us: Spike and Luna and J.R. and Chub, in their spots. When there had been even just one cat, it had been a circle of empty beds used by her; with none, they are all occupied by their rightful residents. Strange about placeness: sometimes a complete absence is necessary to experience a complete presence. We felt it and, perhaps, noted it first when we visited the affecting and spectral Springside, in the Hudson Valley. Now, in a parent’s apartment, around our kitchen table, we feel it again. 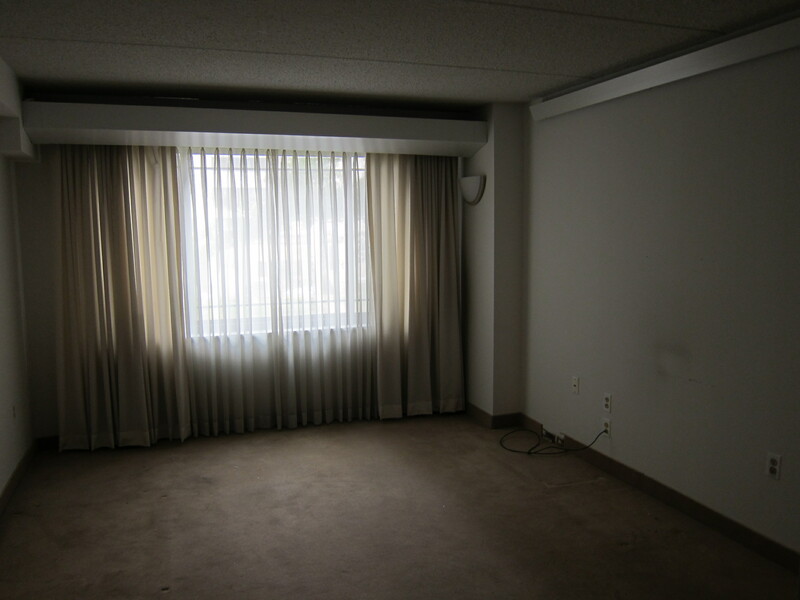 Like an empty stage that still resonates with the energy of the actors that once performed there – all of us, actors on our own stages, in a grand conceptual piece from which the art that then-ness and now-ness and placeness derives and remains. Where we have been will be, to those who loved us, someplace we will always be, in a way they wish us to be always. 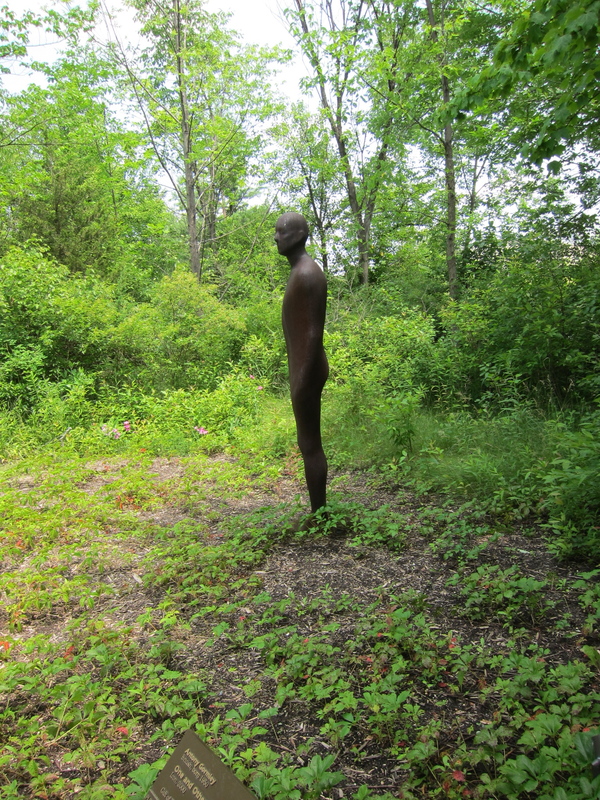 Half of the arslocii team has been eager to see as many sculpture parks as can be viewed. The resulting reviews for those already visited, most of them located on the east coast, and a couple in the midwestern United States, are a mixed bag of placeness criteria – some superb, others lacking. Of the parks previously seen, I would rate the top three, thus far, as, at number one, Storm King, The Fields at number two, and Nathan Manilow coming in third. 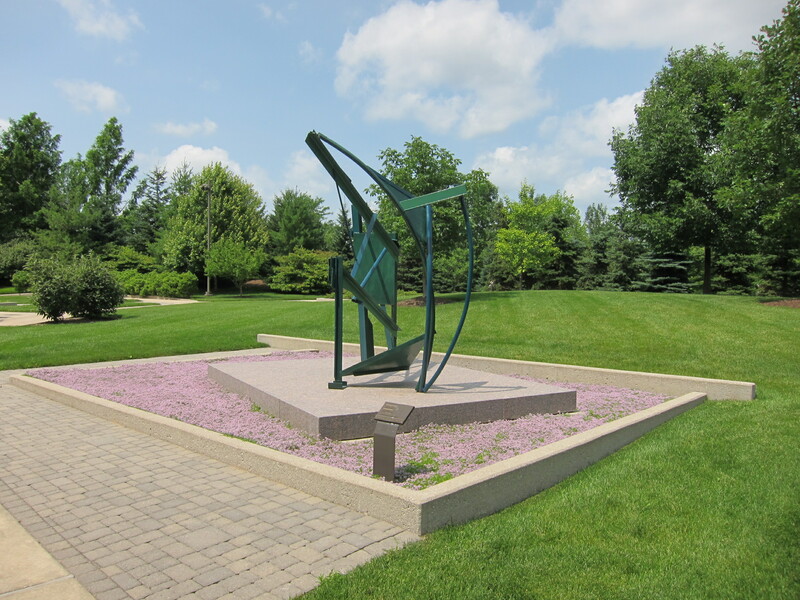 Recently I journeyed to see Frederik Meijer Gardens & Sculpture Park, in Grand Rapids, Michigan. The grandeur of the entrance, the constant movement of trams and the amount of parking slots being equal to the number of picnic areas – all of this made me a bit worried about what awaited inside. And the gardens, too: although they were nice collections and displays, the whole was a little too squeaky clean and informed by crowd-control planned movement. Plus, their big draw for the season was a comprehensive show of Dale Chihuly glass works – weaving through buildings, arranged in gardens, hanging from ceilings, poking out of ponds – so omnipresent that I wondered if this was his entire oeuvre carted here. Seeing that, I was still worried, maybe even more so. I have to say, I was starting to question why I had driven more than 600 miles for this when it was looking very much like Grounds for Sculpture, which I dislike but is only about one tenth the distance from home. Why go so far to be disappointed when you can do it close by? What I didn’t realize going into this, is that the sculpture park is just one garden area in the entire park complex and is probably the least populated by visitors. The other gardens felt too coiffed while the sculpture park, despite being designed, was more naturalistic in its flowing hills and valleys, and seemed more probable in the surrounding landscape. Plus, the art within the sculpture park was better than I expected, based on what was around in the other garden areas. And, yes, the omnipresent Chihulys were scattered about there, too. But if you looked past them, the permanent sculpture collections and their varied settings were quite thoughtfully paired, and some were impressive. Of particular note are two named sections of the sculpture park: The Hollow and The Gallery. (They appear to have named every walkway and designed area of the park, much like the hallowed grounds of Disney, but the sculptures these two areas contain are good works and well-sited.) The Gallery is a formal garden, in the European style, a series of small viewing galleries each with sculpture – similar to the Hirshhorn Sculpture Garden, but with a little more risk-taking in color and design accents at Meijer. Many of The Gallery’s sites are geometric curbed islands filled with various interesting plant materials, ground-level green roofs or, rather, carpets designed to set off and enhance the hovering artworks. 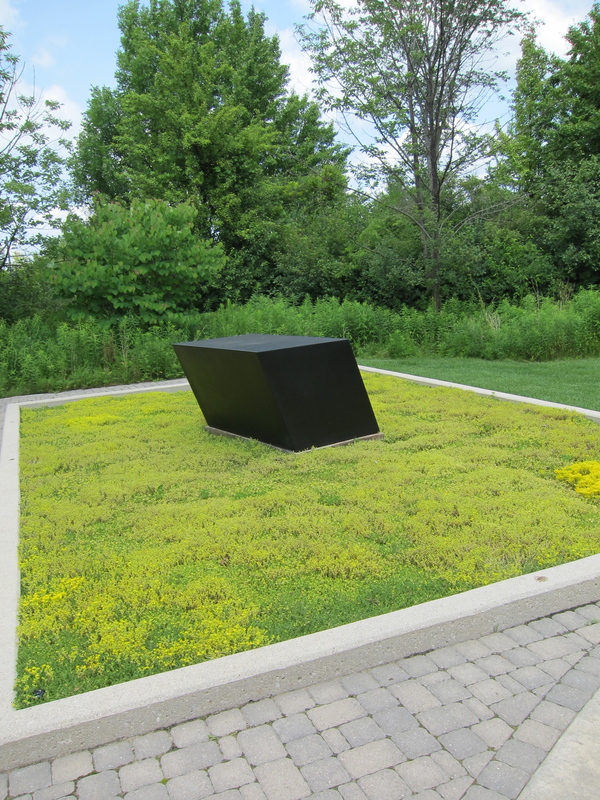 Tony Smith’s For J.W., a black, solid, oblique parallelogram is seated in an oblique shaped “bed” of yellow sedum. The contrasting textures, shapes and colors are kind of breathtaking. Generally speaking, the pavers in The Gallery are too new and suburban looking, but the intelligent placement of the sculpture in its environment helps to overcome the connecting pathways. Not too far from Smith’s work is Anthony Caro’s Emma Sall, a geometric piece with a lot of movement, complemented by a nearly-as-complex installation – an angled pedestal, interlocking varying curb heights and a carpet of lavender alyssum against the teal blue of the painted steel. The Hollow is, in contrast to The Gallery, a more in-the-rough site, with unmown grasses and wildflowers. The artworks still manage to have distinct areas even though they are not as well-defined. In this section, the sense of surprise is key, since it appears to be a wild area and not a real garden. In a small clearing of a woodland is Antony Gormley’s One and Other, a figure encased in iron, isolated, alienated, trapped – a kind of upright sarcophagus – a frightening vision found in a hidden glade. 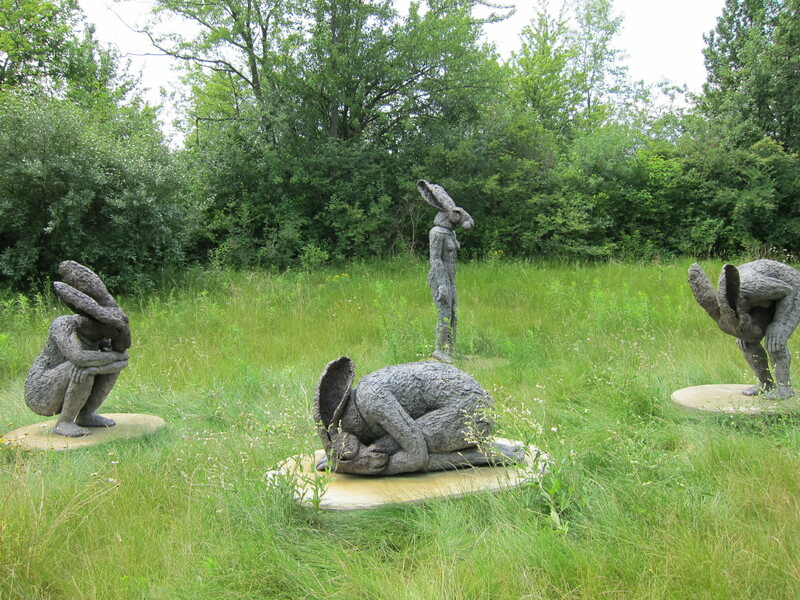 A nearby open meadow offers Sophie Ryder’s Introspective, a bizarre grouping of figures that are half human/half rabbit, in some sort of stop-action poses, or, perhaps, a new take on the Ascent of Man. This work has a similar effect as the previous one, in that you don’t know whether you should be privy to what is taking place – both sculptures being perfectly placed and in synch with their environments. 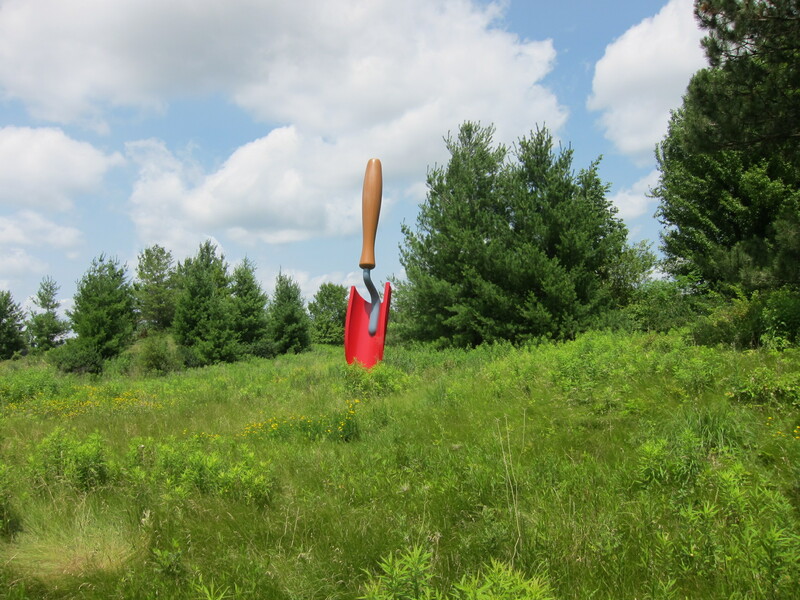 Also “planted” in The Hollow is the Oldenburg and Van Bruggen Plantoir, another of their tools on steroids, this one comically painted up but standing erect on an untended hillock – looking completely in and out of place. 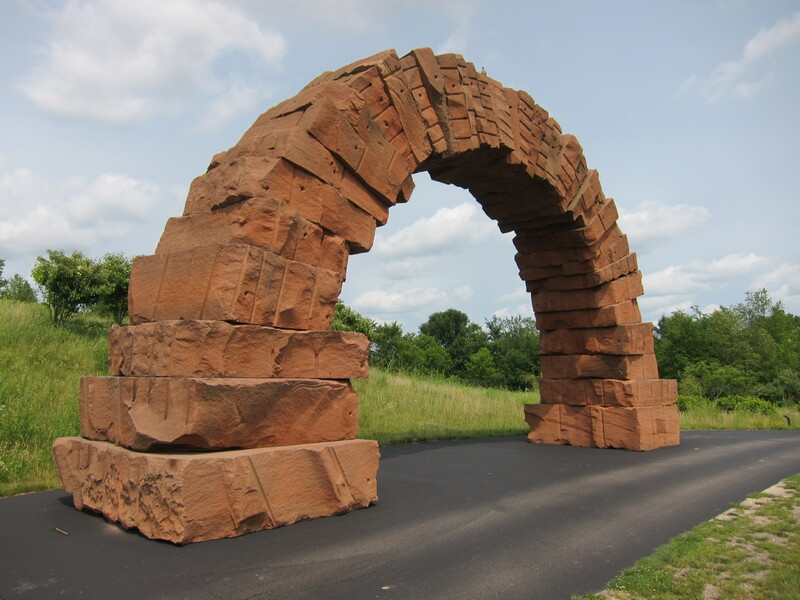 Back on the major encircling walkway of the sculpture park, and high on a rise, stands Andy Goldsworthy’s Grand Rapids Arch, like a huge red sandstone inchworm, as it surveys the landscape. Curious for the artist to have placed it in the road like he did – the blacktop, not the earth, acting as its pedestal – it is reminiscent of formations you might see in Arches National Park – but in the roadway. The two together, the sculpture and the asphalt, seem to be saying something about the West. So, placeness does exist at Meijer Sculpture Park. I wouldn’t say it is the overriding theme of the park but someone there has given meaningful placement to many of the artworks, resulting in a symbiosis between art and site. And given so many other gratuitous displays throughout the gardens, the instances of arslocii become all the more special. In that way, Meijer’s park is a lot like life. 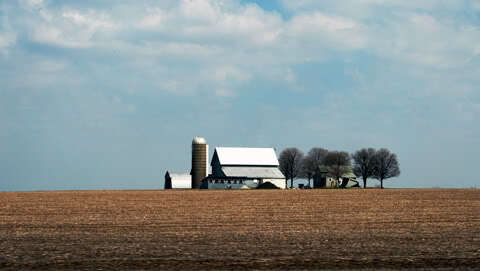 Driving through the midwest, in northern Ohio and Indiana, I observed, and thought about the idea of, the farmstead. Growing up, I always had an affection for the somewhat isolated farms that dot the landscape. They appeared to be one-family small towns or manmade islands floating in a solid sea of germinating seeds. They were quaint, throwbacks to the homesteaders of pioneering stock, independent nations and emblems of self-sufficiency that represented a more direct connection to the land that we all inhabit and most of us never experience. And, then, there were their design elements, the patterns of furrowed and sowed rows of agriculture, the variety of colors of the soil and the texture of the growing foods. An arrangement of lines and angles and shades of greens or browns, crisscrossing 100- to 200-acre tracts with a cluster of buildings at their center or placed at a transecting road’s edge. From airplanes, farms are incredibly beautiful designs on the landscape, continuous quilts covering the flat terrain and the hills and valleys. Like the Nazca Lines, the designs invite the sky dwellers down to earth with verdant color. But the real purpose of farms is life-giving nourishment. Food. Originally, farms were oases of self-sustainment, the only way to survive in the wilderness that was much of America. And once you increased the acreage to a certain size, the purpose of a farm changed to one of production – a surplus creating a demand in the marketplace – and the farm became a manufacturer of food for the cities. 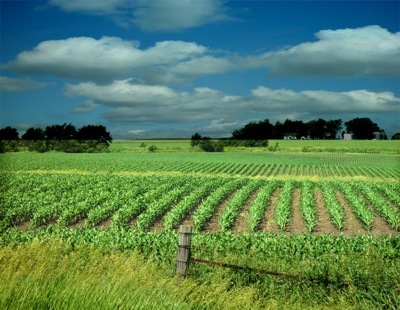 As cities burgeoned and farms stepped up production, a kind of balance was reached in which farmland that encircled the urban centers was supported by the areas of no farmland, and vice versa, as cities were left off the hook for generating agricultural foodstuffs. A kind of yin-yang of urban to rural ratio. But all that changed, and now there is an imbalance. After reading Michael Pollen’s The Omnivore’s Dilemma, I am struck by how the meaning of a farm has changed for me. Where I once saw sustenance, now I see just industry. Industrialized farming has taken over real hands-in-the-dirt farming. Monoculture has replaced diversity. Farms resemble machinery now rather than homesteads. My affection for them has waned in proportion to their own disconnection with the earth. 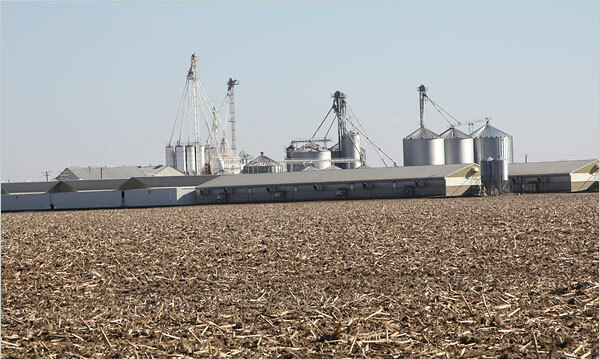 Their multiplex silos with numerous chutes look like tentacles, or perhaps some giant upside down milking machine, sucking the life out of farming and the land. 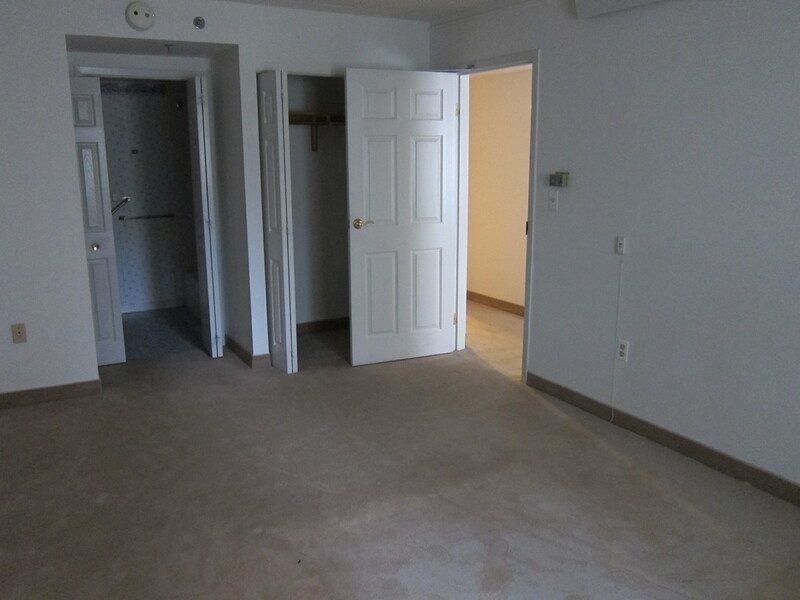 Everything is enclosed, secretive, overwrought, sterile, maybe even scary – an encased, entombed facility that appears to have no connection to the land, human hands, sunlight or air. The farm has become a factory, its appearance, once charming, is indistinct from a steel mill or a quarry. It is hard to imagine that people live in these complexes still. And, based on the ones I just viewed, they are all alike, as uniform as any American mall, all the individuality removed, as in a lobotomy. What has happened to us? What kind of world have we created – one in which we are removed from reality and left with fake manufactured food (new and improved)? Why are our farms not farms anymore but rather plants (an irony in the term itself)? What is it in our country, the supposed land of independence, that we allow these losses of control to occur, that we let anyone and everyone determine our fate, just for the profit of a few and a huge loss for the rest of us? What kind of place are we creating: a place of no place? A faux place. A placeless place. 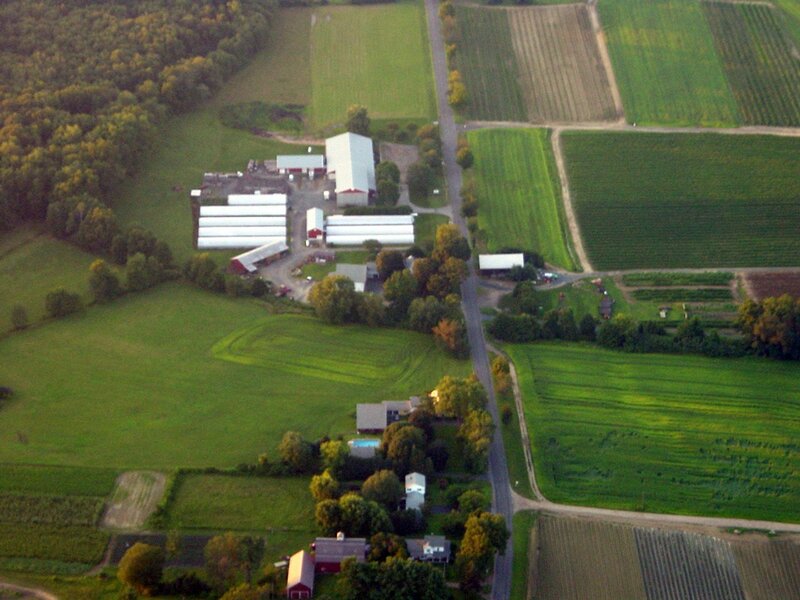 Farms used to represent a real placeness, something that was often hard to replicate in an urban setting and certainly not in the suburban clusters that are replacing them at a rapid rate. Farming on the grand, multicorporate scale obviously doesn’t have that quality anymore. Think about what could have more placeness than Auntie Em’s farm? Remember, there’s no place like it.